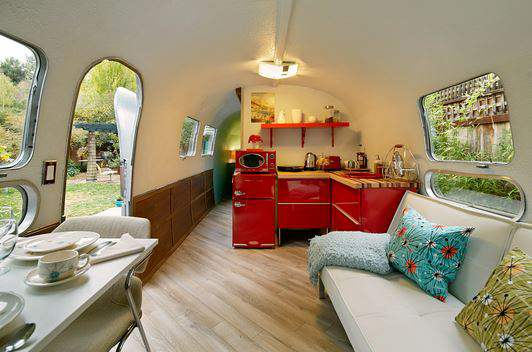 I found that there are quite a few camper renovations out there that deserve some showing off so I thought I’d share them here. 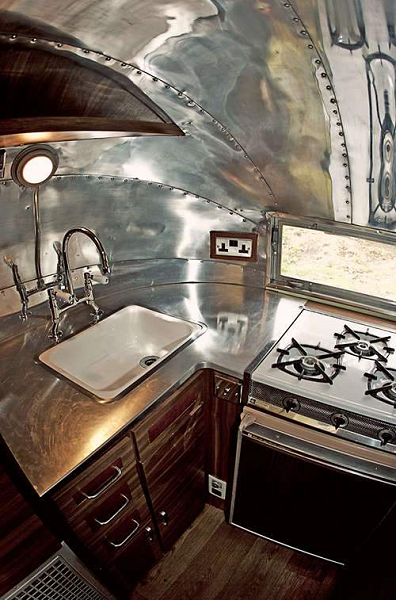 This first one from The Noshery kept some of the unique vintage appliances, polished them up and mixed them with modern decor. 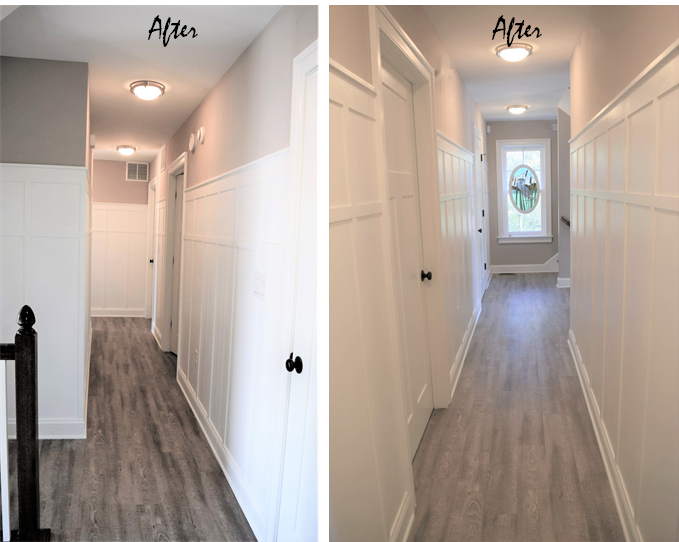 This one from Fancy Farmgirl (whose blog it seems sadly doesn’t exist under that name any longer) is light and bright, making the space seem so much larger. 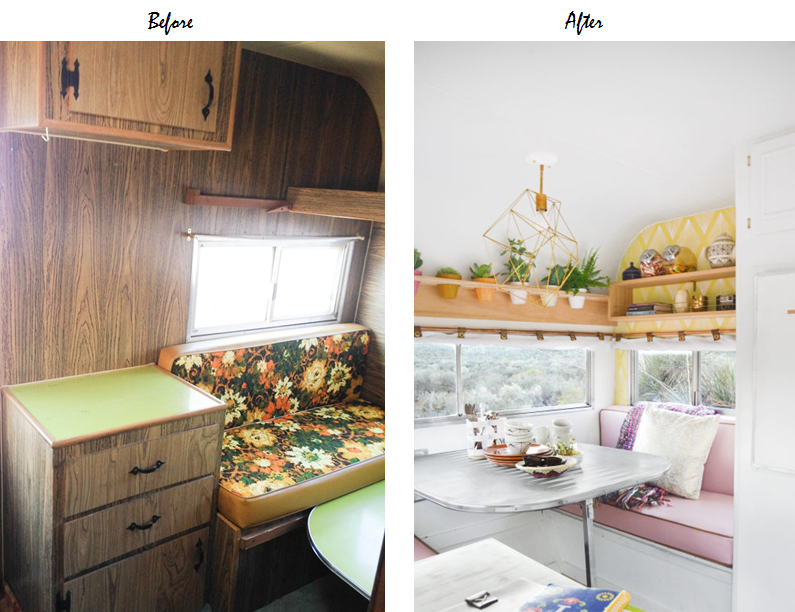 These camper renovations are makeovers of quintessential Airstream trailers, with their telltale stainless steel accents and domed roofs. And finally here’s another before and after highlighted by Country Living. 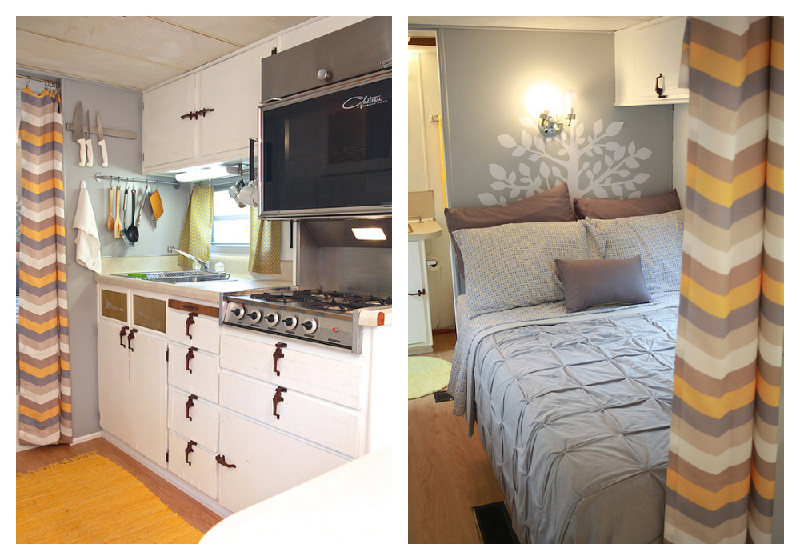 The change from old fake wood to bright aqua ceiling and white cabinetry bring this Airstream into the current decade. 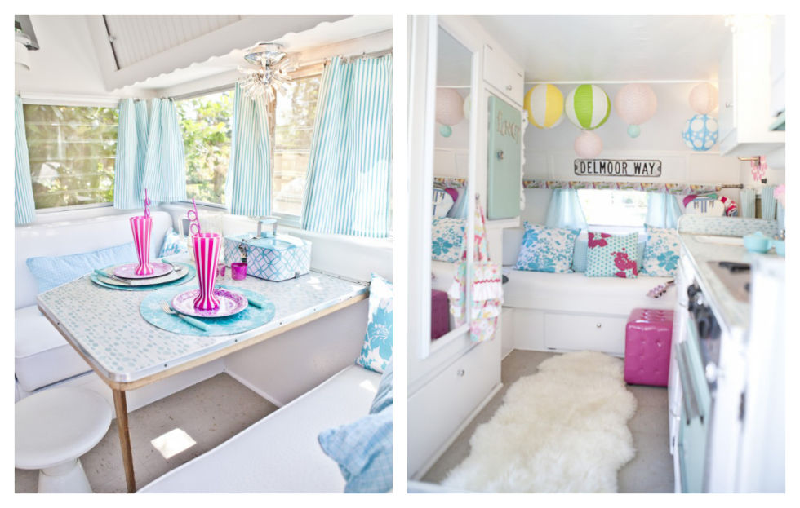 This makes me want to embark on finding a camper to flip…. I can hear my husband grumbling now… but no worries honey, for now, you’re in luck, I’ve got nowhere to park it. The colors of old glory, perfect in their patriotism and symbolism of the US of A, yet colors that are often poorly designed and styled. Frequently this patriotic color combo is avoided altogether because, let’s face it, nobody wants their house to look it came straight out of a 1980’s issue of Country Living or like Grandma’s reproduction Amish quilt. Doing red, white, and blue right can be hard, but it CAN be done. 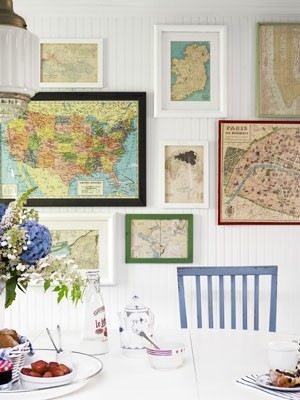 With some patience and a discerning eye the colors of the USA can be great in a nautical look, a playful kids vibe, a rustic farmhouse look, or a more traditional style. 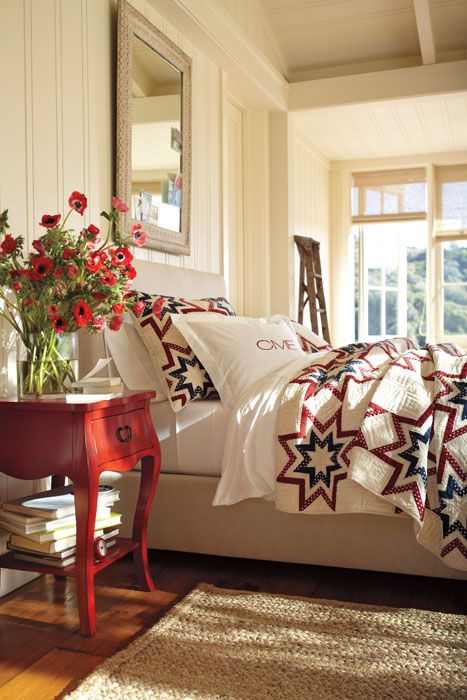 Here are a few examples of red, white and blue styled rooms that look oh, so perfect! 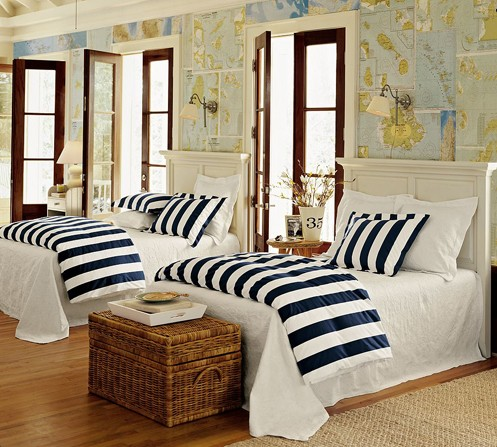 Here’s a modern nautical bedroom from County Living. Before looking at the room you might think that striped bedding AND striped wallpaper would be overdoing it, right? Nope, in here with the simple metal bedframes and lots of bright light it all works. 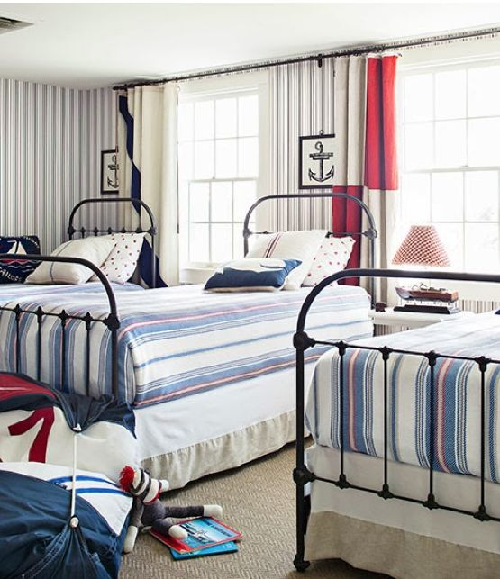 I particularly love the curtains that are each different large scale nautical flags! This farmhouse cottagey look DOES utilize an Amish looking quilt, but it’s styled so perfectly with the warm white walls and pops of strong red (not a washed out red that would look too country) in the nightstand and vase of poppies. The jute rug adds a natural, neutral element that grounds the entire space. Photo via pinterest. This traditional space featured on B.A.S. is a relatively small space with tall ceilings. The designer here went crazy with mixing patterns, BUT it’s visually supported by so much neutral and white that it totally works. It doesn’t look cheesy Americana or anything, just a fun version of traditional, and it totally works. 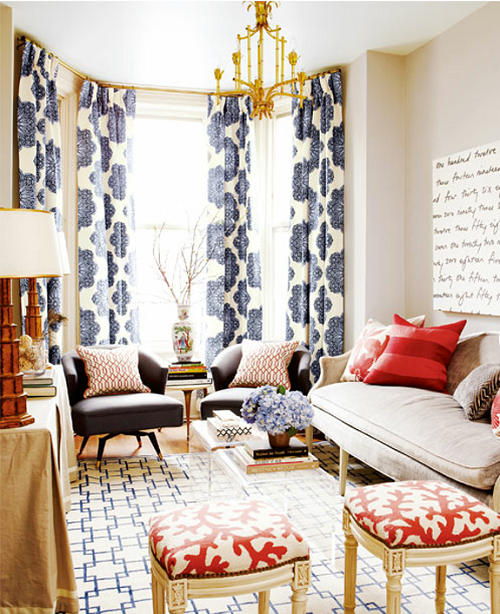 Another traditional space, this one by Andrea Schumacher, mixes soft blues, bold reds and tones it all down with neutral grasscloth wallpaper. 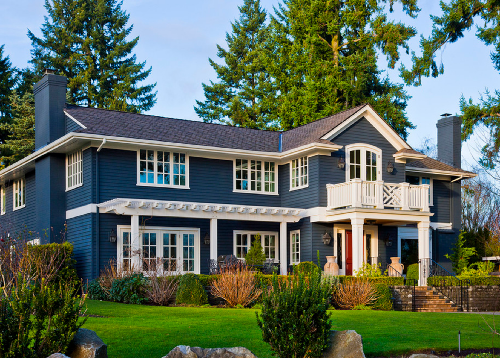 This classic color combo works on home exteriors as well just like this one here by Andrea Braund. 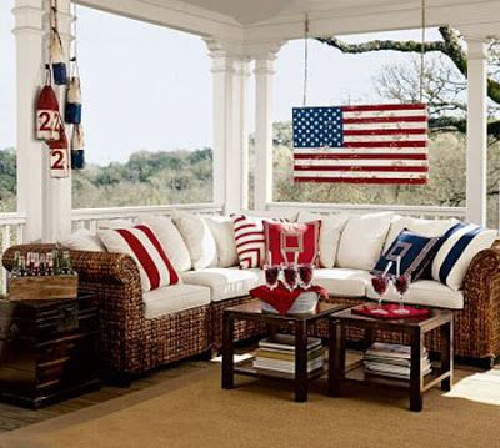 And certainly, if there is any place where you can get away with a little bit of patriotic kitsch, it’s the front porch, since it’s almost more like holiday decorating than permanent decorating. 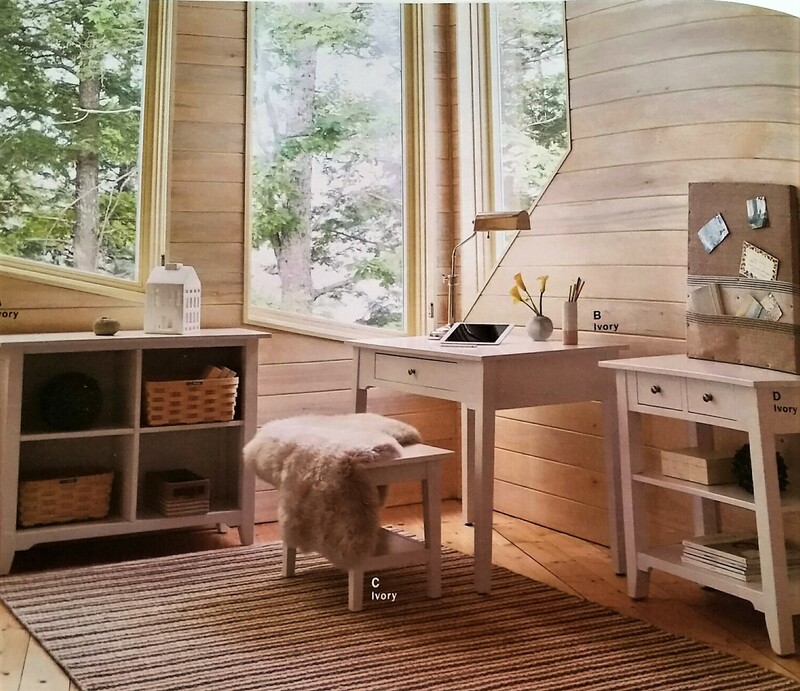 This one, which I think is a several years old styling by Pottery Barn, still looks classic and cute. Have a fun Memorial Day weekend and please take a moment to remember all those who have died in service to our nation and have given so much to keep us free! Rental season in the OBX is gearing up for us right now, so I’ve been busy with handling last minute crises like broken icemakers and area rug cleaning. But four years ago, we were only concerned with making sure we created a home that fit both our family and our future rental clients. 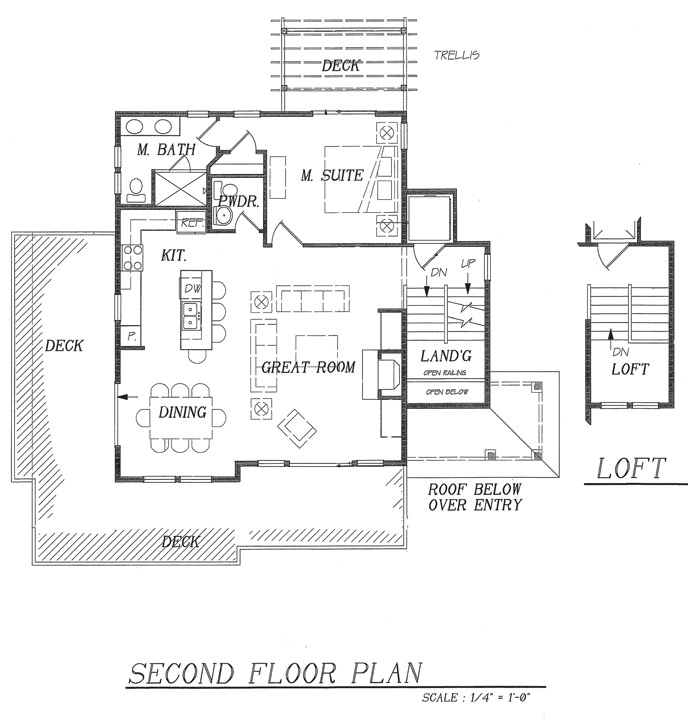 We loved to peruse home design magazines that were filled with floorplans and websites where you can order a stock floorplan. Initially, we thought that getting a custom home would be far too expensive and that we’d be stuck with a stock plan. We were so wrong about that! 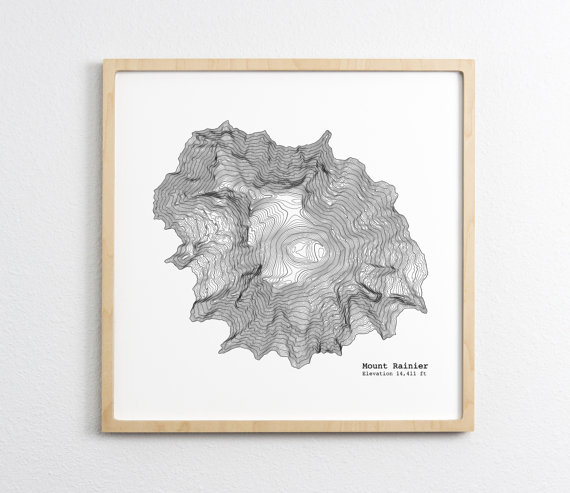 Our builder recommended a few designers, we perused examples of their past work online and ultimately went with his recommendation on who he thought would give us the result we were looking for. In the end the design of the home was very affordable. It cost us only about 1% of the total home cost and we got exactly what we wanted! A relatively small footprint at about 2500 sq. 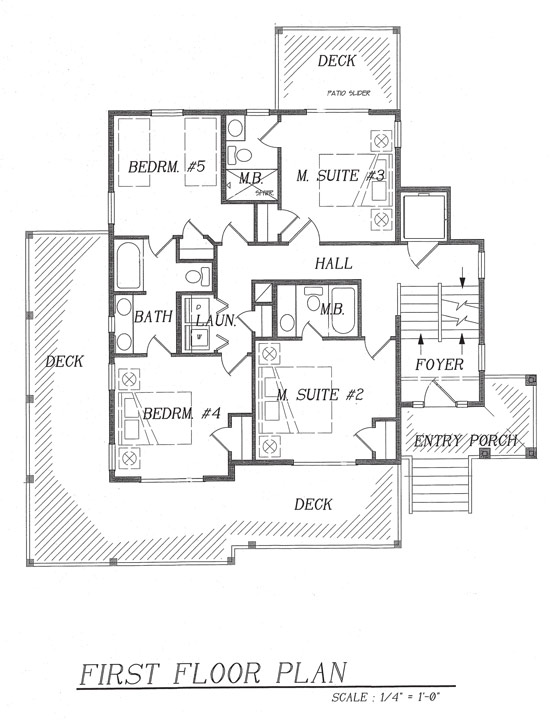 ft.
A reverse floorplan, meaning that the main living areas are on the top floor. Again, our goal was to maximize any potential ocean view. Incorporation of a “ships watch.” Yep, you guessed it, highest potential area for views. Stairs situated on the side of the home (center stairs, while popular, take up and break up open floor plans). 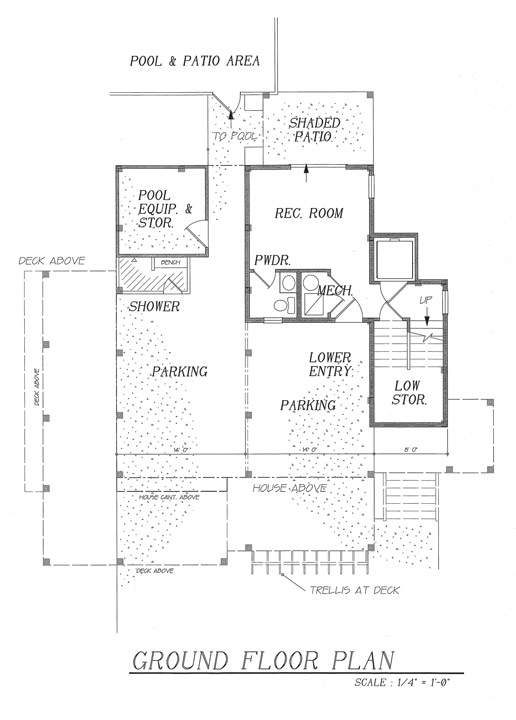 An open floor plan on the main living level. A home that sleeps at least 12. 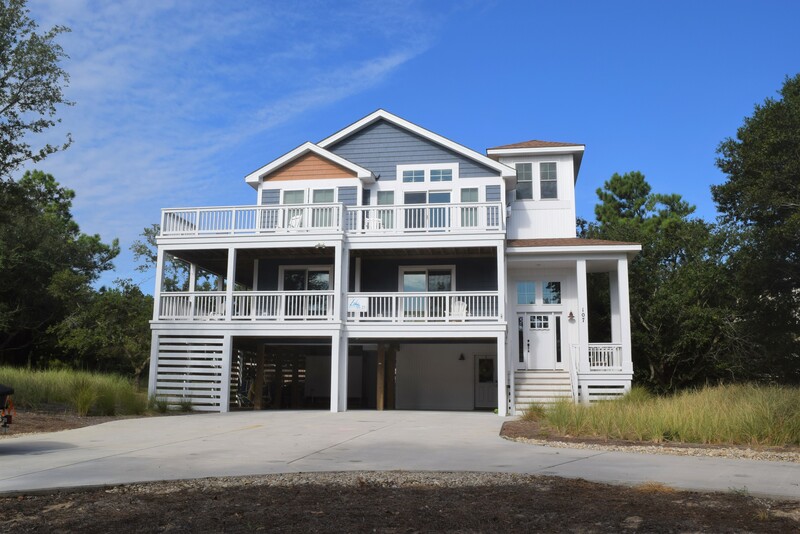 Many vacationers choose to rent homes with family or friends and pool resources, and for some reason a home that sleeps 12 is the “sweet-spot” of rentability / cost effectiveness for the OBX rental market. As many en-suite bedrooms as possible. So that families joined together on vacation can at least have a private bathroom. We made 3 bedrooms en-suite and the other 2 share a jack and jill bathroom. Room for as many king beds as possible. We were able to make 3 bedrooms king, 1 queen and then a kid’s bunk room with 4 twins. A dining area that can seat as many as the home sleeps, so in this case, 12. 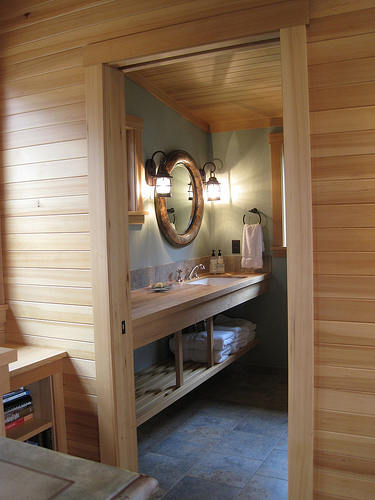 Whoa, that’s a lot of stuff to cram in 2500 square feet! Thankfully the lists overlapped a bit, so we gave our requirements and some exterior sample photos to our designer and he came up with a perfect floorplan and use of space. I recall us just working through a few tweaks here and there before we were ready to get cracking on the build! Design-Build Firm, Designer or Architect? We learned so much from this process, and it was fun! Our major takeaways: When you are building at the beach there may be special building codes or just good practices so I highly recommend hiring a designer who is from the area where you are building and is familiar with both the codes and the concept of vacation rentals in that specific area. 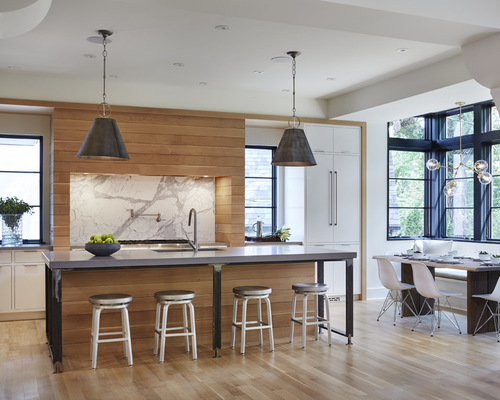 A common misconception is that you have to hire an architect when in fact, a designer, in conjunction with an engineer can accomplish the same great design for your home! To View or Not to View… That is the Question!!! *A funny story about those views. Our property is about 2 blocks from the beach, in a treed neighborhood with other homes between us and the beach. We had absolutely NO IDEA if we’d build this house and have an ocean view. All of our neighbors were smaller/ lower homes so there was no way we could ask them to stand on their deck and know if we’d get a view. We attempted to duct tape our digital video camera on 40 feet of PVC pipe and raise it over the trees on the highest point on the property. We did this in the presence of our designer and builder and they probably thought we were a couple of nutjobs. We may have felt legitimate had it worked, but it didn’t. The resolution on our camera wasn’t good enough to see that far. Maybe if we were building today we’d use a drone. Anyway, we went into the design and build process knowing that all those requirements on our list for an ocean view may be for naught. Spoiler-alert! In the end, from both the top deck, main living area and the ships watch we DID achieve the tiniest ocean view ever! Even still, we love it, with all the windows and doors open it feels like a treehouse up there viewing bright blue skies through the tall live oaks and pines. It’s heaven. Shiplap, shiplap, shiplap! With a twist. I feel like all we’ve heard about the last 2 years on design TV is shiplap, shiplap, shiplap! 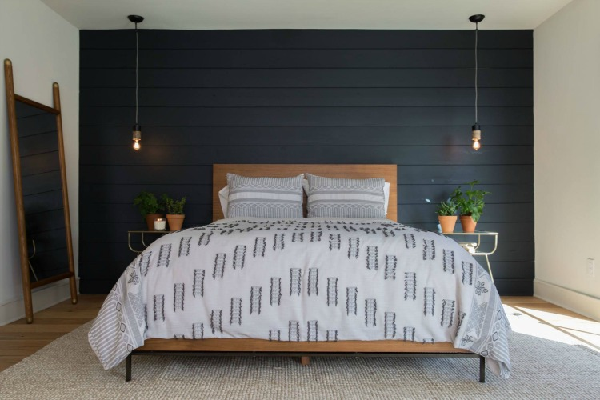 Thanks to Chip and Jo on HGTV’s Fixer Upper the 6-inch-wide horizontal wood planking has become a popular design feature for a light, yet rustic farmhouse look. 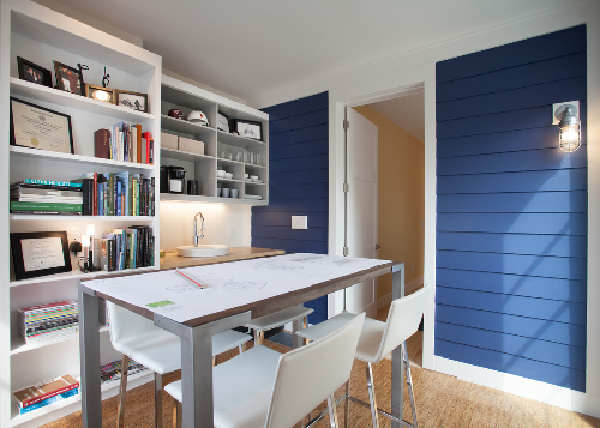 But what about a twist on this traditional shiplap look? 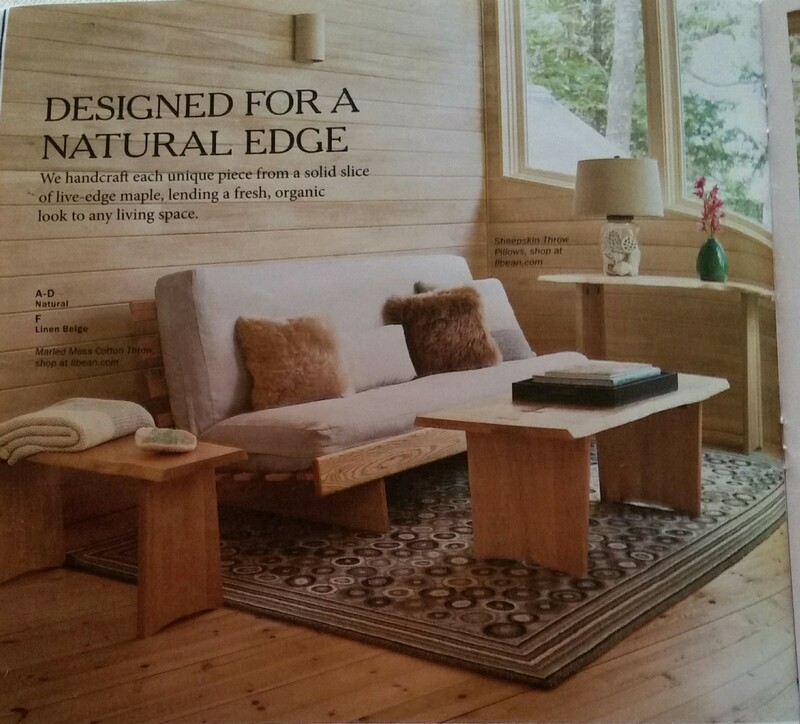 I was flipping through the LL Bean Home Summer 2017 Catalog and while I’m not a huge fan of their very country looking furniture, I was taken by a few shots with a natural ashy wood colored shiplap. Even styled with their basic furniture this version of shiplap lended a modern styling to the overall look. 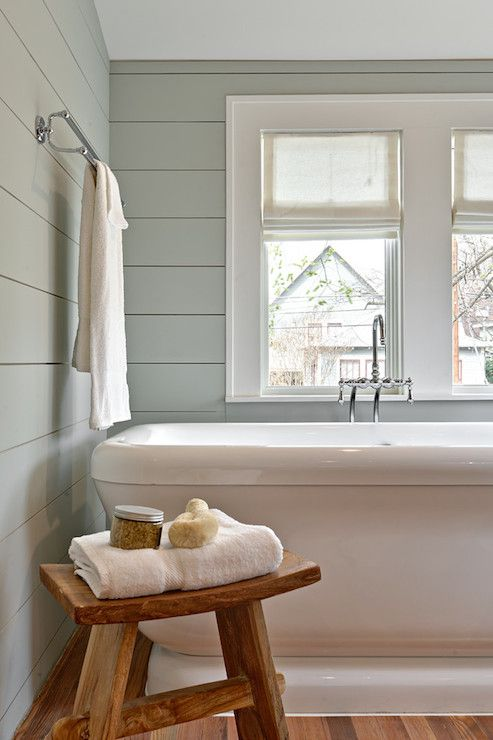 So, I went on a search for some other versions of shiplap than the basic white and found a few great looks that I wanted to share. 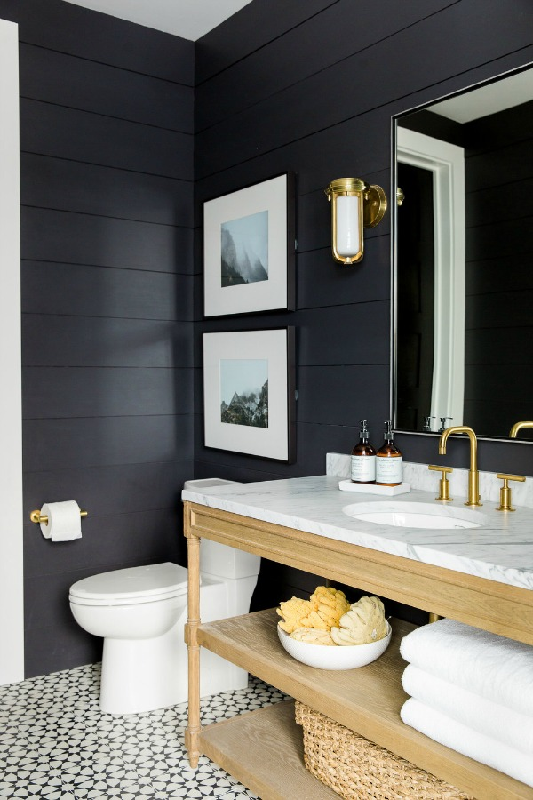 Turns out shiplap looks great in natural wood, a rainbow of colors, and even in black! 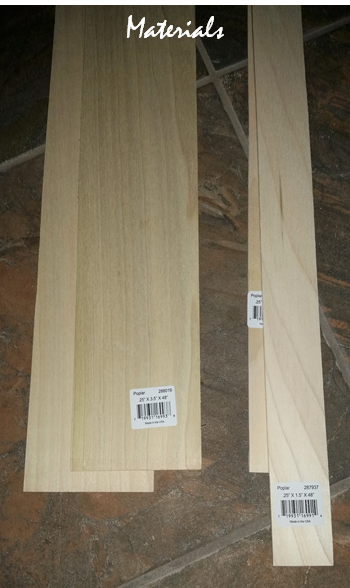 Easy Board and Batten Project for Under $200!! So as many of you may know, I own a vacation rental property in the Outer Banks of North Carolina. 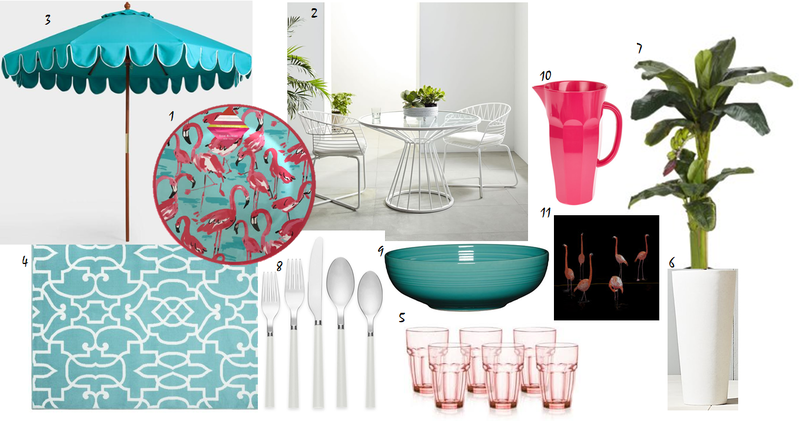 (And you can read all about our adventure embarking on a vacation rental here). Is it wonderful owning a beach house? Yes, it is. It is a sanctuary for my family. Is it ALL bliss though? No, it’s not. Wait. Why, you ask? Because our dream home is rented out to folks who mostly don’t take care of it and don’t worry about damaging or breaking anything, and, in a way, I can’t blame them, they are on vacation. They aren’t worried about spilling sticky stuff down the front of the cabinets, cleaning the crusty stuff off the grill or dinging the walls as they roll their suitcases down the hall. 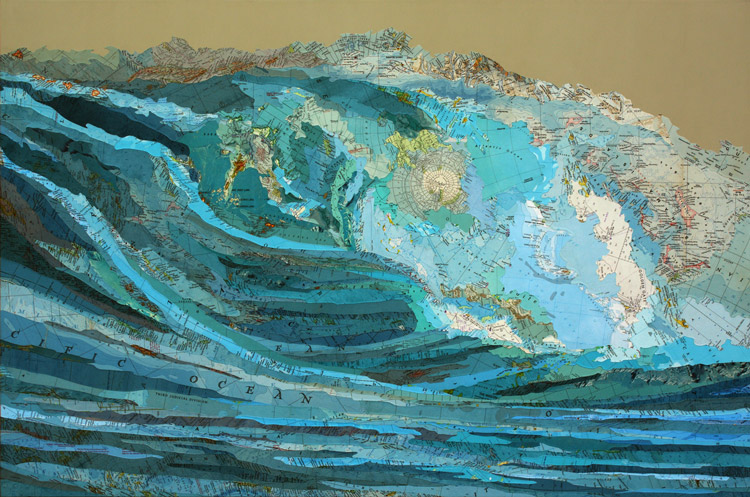 After a season of rentals, I often feel like crying as I wander the house assessing the last 4 months of “wear and tear.” Occasionally, there are issues that take a professional intervention. For example, we recently had to have sensors installed on the exterior doors that turn the HVAC system off when the doors are open. When renters leave the doors open while the AC is running, then hot, moist air from outside colliding with cool dry air inside, not only creates monster electric bills, it also creates excess humidity and potentially mold in the house. Thankfully though, most renter rigors can be fixed pretty easily (magic erasers are a wonderful thing). In the 3 years since our rental had been built, I was continuously either magic erasering or repainting our 2nd floor hallway because it got a lot of abuse from things banging against it; suitcases, laundry baskets, coolers, you name it, it’s apparently bounced off the poor flat-painted walls of this hall. This past week was spring break and my family and I headed to the beach for some home maintenance and relaxation. 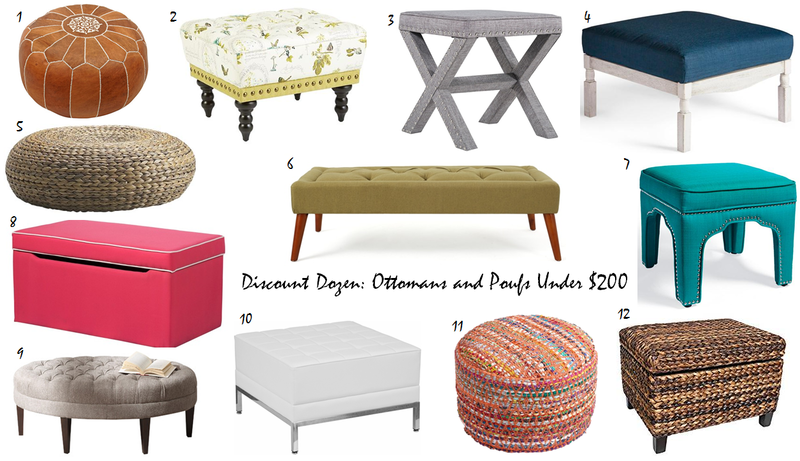 (While projects may not sound fun to most people, I have trouble sitting still, so I need a home project to relax). 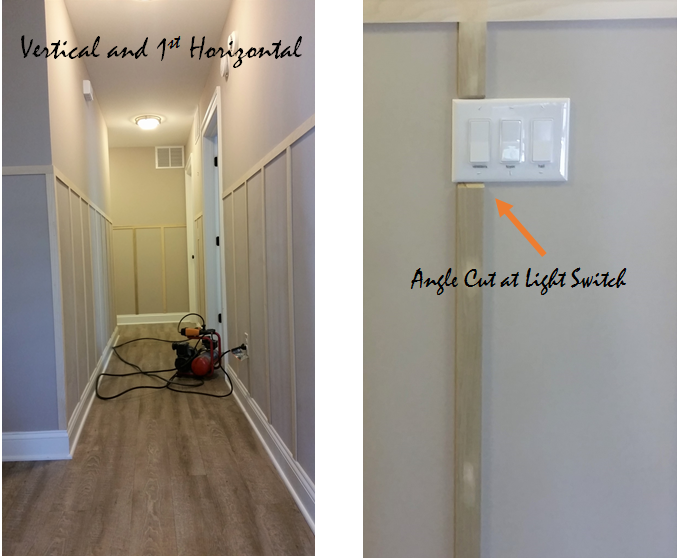 I decided to create a board and batten wall down the hallway in the hopes that the finish (being a semi-gloss, interior trim finish) would stand up to the scuffs and scrapes better than ‘ol flat paint, and easier to wipe off. 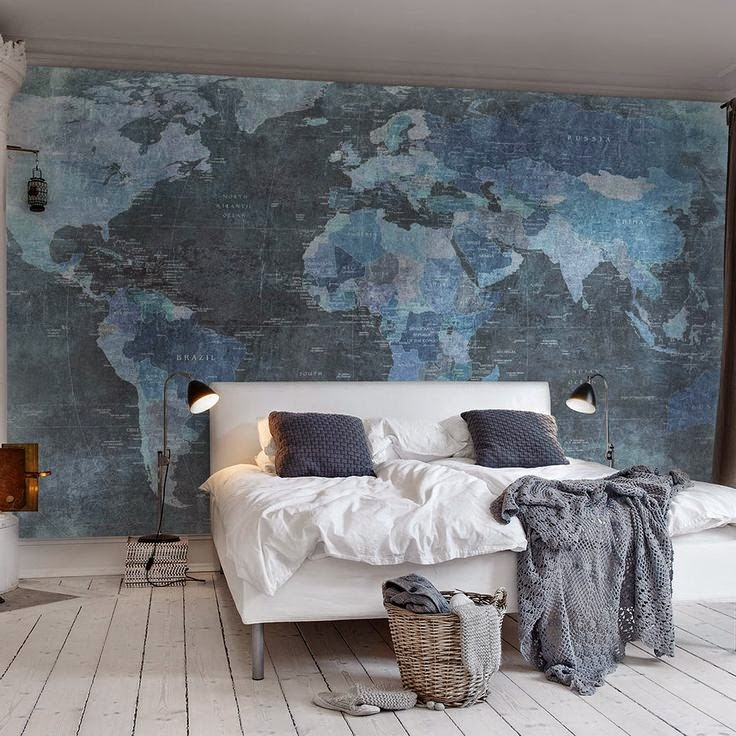 First step, after scouring Pinterest for ideas of course, was to measure the walls and acquire the materials needed for the project. We already had decorative baseboard which we wanted to keep. 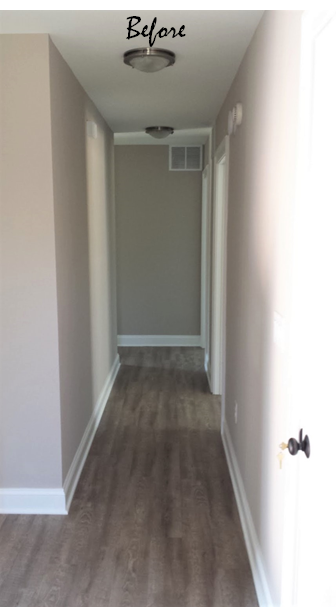 The baseboard stuck out a ¼” from the wall, so we were looking for a material with ¼” thickness that wasn’t too expensive and wouldn’t require too much sanding and finishing. 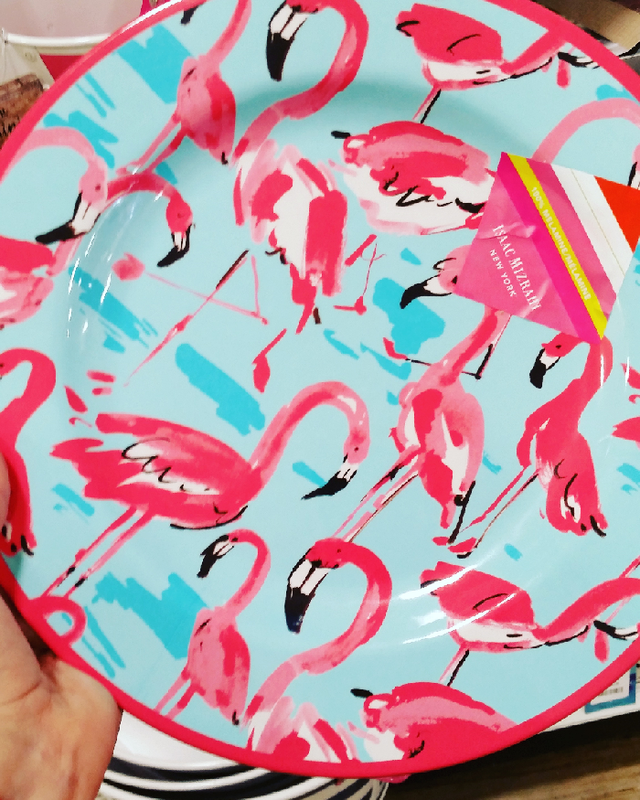 We found everything we needed at Home Depot…in Virginia… apparently our local beach Home Depot didn’t carry this same material, so we bought it in VA and schlepped it all the way to NC. Sherwin Williams SuperPaint Interior Latex Semi-Gloss (The color is untinted white since the rest of the trim in the house was already this color). Construction adhesive (note we didn’t glue & nail, just nailed, but in hindsight, it may have been a bit sturdier to do both, I suppose time will tell). We began by measuring the walls, and determining the pattern in which we wanted to do board and batten. There are multiple variations; some with wide boards, some with thin, some with a top cap, some without. Whichever one you want to do is fine but definitely design first, construct second, winging it is not recommended. After we determined the height of our board and batten and we measured the longest / most prominent wall and determined how frequently we wanted the vertical boards to repeat in a way that we wouldn’t end up with a weird partial batten at a corner. For us, this was about 14” apart. 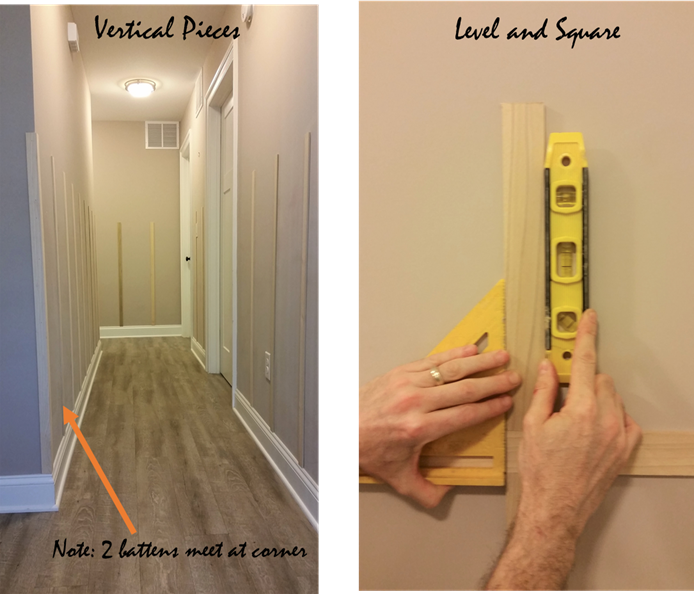 On all other walls, which were either broken up by doors or shorter in length, we first laid the boards out at 14” apart and if they created a weird space we “fudged” the 14” pattern into 13” or 13.5” or even 14.5” apart so that all battens were visually appealing and well-spaced on all walls in this hall. We leaned each vertical batten in the approximate area where it would get nailed to the wall. We nailed the first batten in at the edge of the hallway corner on the “main wall”, we measured for accuracy, held the level up against the batten to ensure it was level from top to bottom (nothing worse than crooked battens). Note this works best with two people, one holds and wields the nailgun while the other measures and levels. Did each 48”x 1 ½”x ½” on all walls first. Then we levelled and nailed on these same boards in a horizontal fashion across the top. Next, we cut more of those same boards into 12” sections to make the next vertical pieces. We repeated the levelling and nailing process (which is easier with pieces that are only a foot long). Finally, we placed, leveled and nailed on the 3.5” boards horizontally across the top and topped it off with a little ledge or top cap. Already with just the wood up I was liking how it made the hallway instantly more interesting. Next came the boring, messy parts. All gaps, joints and nail holes have to be filled with wood putty and sanded smooth. This creates a mess. In a space as confined as this we ended up setting off the smoke detectors with dust, and then forgot that our system there was connected to the fire alarm, and since we don’t live there all the time it took us a while to remember the code to shut it off. We used the caulk to fill in any long vertical or horizontal gaps between the wall and the battens. If you miss any or think that some gaps are too small to merit caulk, wait until you have a coat of paint up and if you see black space among white boards, you need more caulk. After all gaps and holes are filled, sanded and dust wiped off its time for priming and painting. 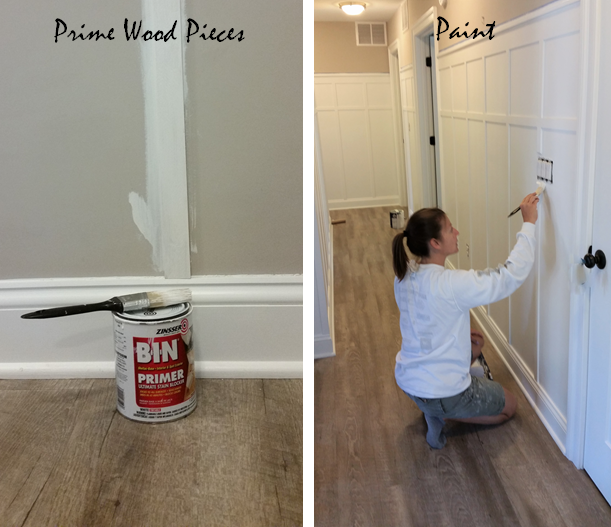 Note this post is not sponsored in any way, but the ONLY primer I have found that covers up wood knots and prevents the yellow-ish seepage of wood juice (there has got to be a better term for that) through paint is a primer called BIN. This stuff is pricey, but awesome. It’s surprising, because it’s milky in consistency and goes on thin, dries fast and will need 2 coats, but it does its job. 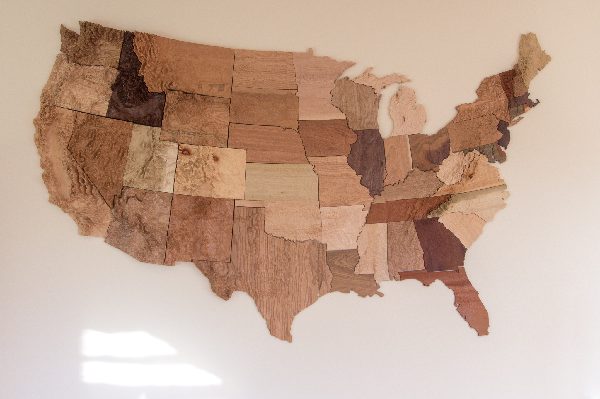 It’s really only necessary to apply this to the wood parts of the wall. After priming and letting it dry overnight, I added 2 coats of semi-gloss paint. 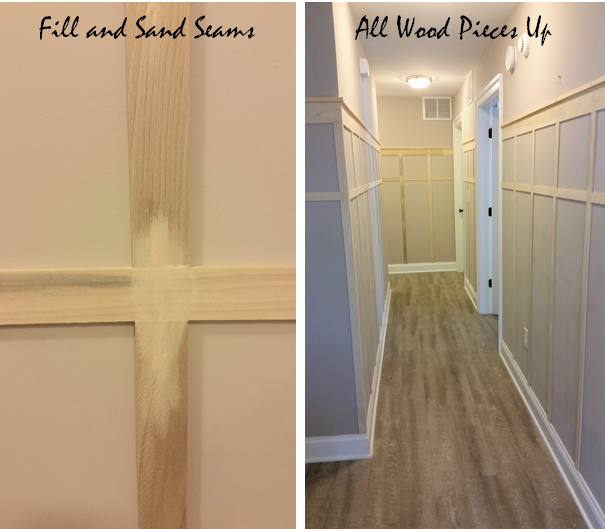 I used a brush on all wood parts and a roller on the wall portions. In hindsight it may have been helpful to paint the walls prior to putting up the wood or to use a foam roller as that gets in nooks and corners better than a large roller. Since the board and batten is technically a trim, it looks best in a semi-gloss finish. The project took 1 long weekend to complete and we spent about $200 in materials, and what a difference! I can only hope that it will make cleaning up after scuffs and dings easier, or at least less noticeable. Already I like how the amount of white in the hallway makes the area seem larger and brighter than just the plain greige paint. Hmmm, if this works maybe I could continue it up the 3 flights of stairs too? 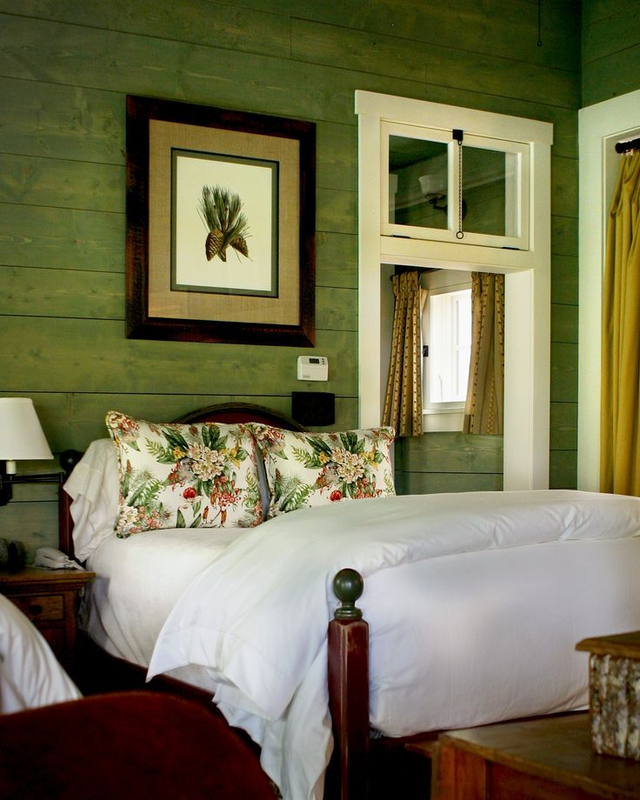 Sure, it’s nice to flip through the pages of Southern Living or troll Houzz to longingly gaze upon houses with sweeping verandahs, wrap-around porches, or terraced front yards lush with mature shrubs and blooming flowers. 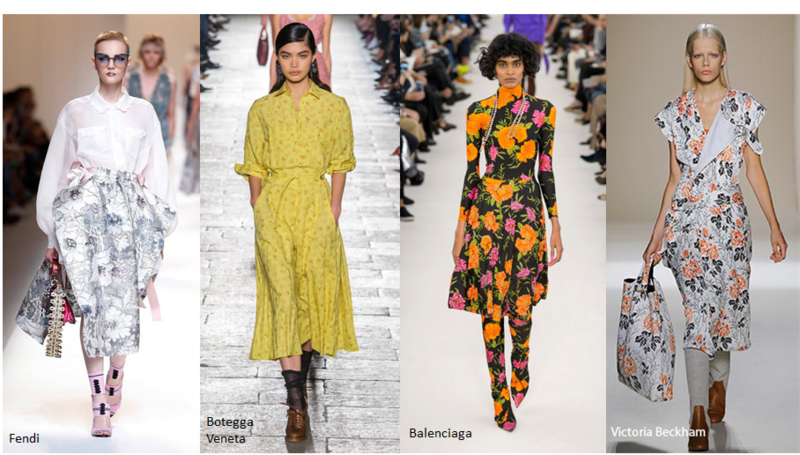 However, the more realistic view of our home’s curb appeal likely consists of a small patch of lawn that may be more weeds than grass, a miniscule porch or portico, and an ugly cement walkway. If you have a smaller home and a smaller front yard, how do you get that elusive “curb appeal”? The simple answer is to distract the eye with appealing things to look at, which is, truthfully, easier said than done. Here are a few tips to up your small home curb appeal from the simple to moderate to the more difficult. Add 2 planters that match on either side of your door or walkway. Go for a tall planter with a simple boxwood or evergreen for a classic look. 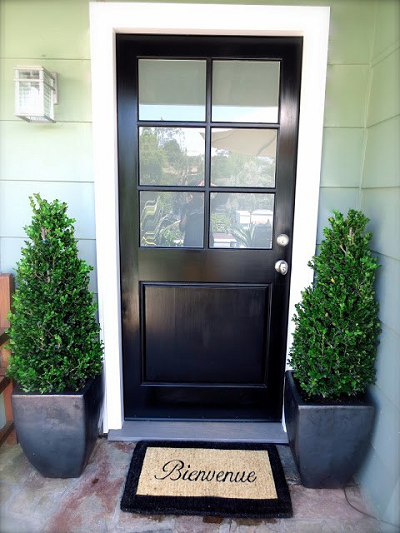 This simple front door from Cococozy looks loads more put together with the boxwoods flanking the black front door. The biggest mistake people make with large pots and tall planters? Well you spent probably over a hundred bucks for large planters and then you figured that you’d want to show off some colorful flowers in them…. only the flowers are usually miniscule compared to the scale of the pot. So, if you’re using a large pot or tall planter, go with a large plant that matches the scale of the planter. 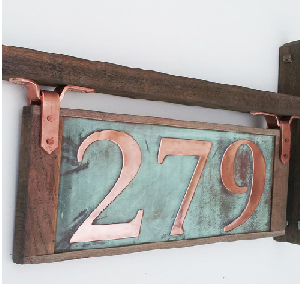 Change up your house numbers. Most of us probably have numbers that look similar. Why? 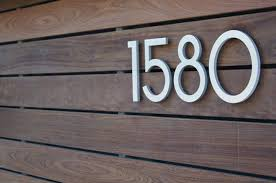 Because whomever built the house put the cheapest numbers possible on. They probably look something like this, right? Brighten up the front door with some paint. 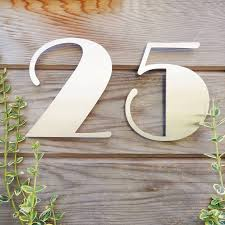 Sure, it may be a bit of a hassle, especially if you have to go through the process of getting approval from a homeowner’s association, but a new coat of paint on the front door especially in a bright or unexpected hue can make a world of difference. 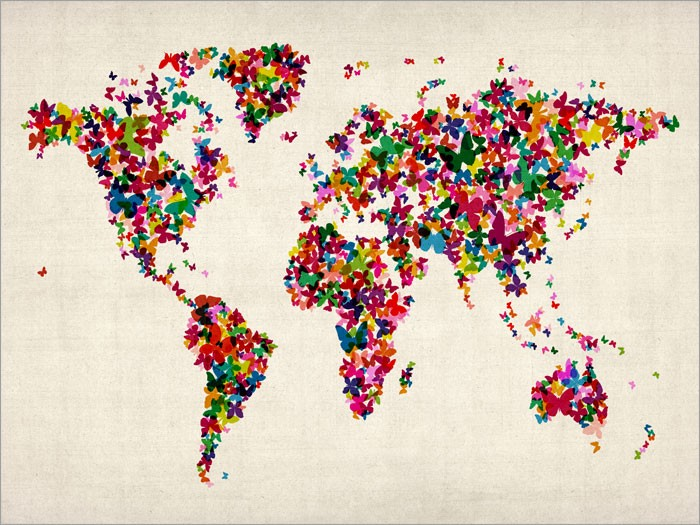 Be sure though to limit the colors on the front of your house to no more than three or it can go awry quickly. 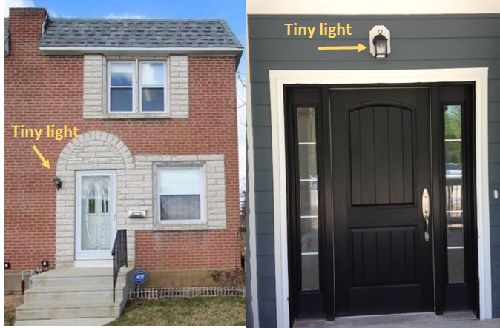 So, if you have red brick (a neutral, doesn’t count as a color), white trim, black shutters, you can introduce a new color on the front door. But if you have a blue house, white trim, cedar accents, adding another bold color might be a bit too much. These doors here are so bright and inviting! Add new porch lighting. Typical homes probably have front porch lights that look like this. 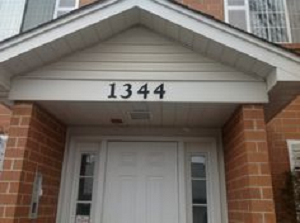 The ones that builders put on community homes are almost always too small (and usually lacking style). 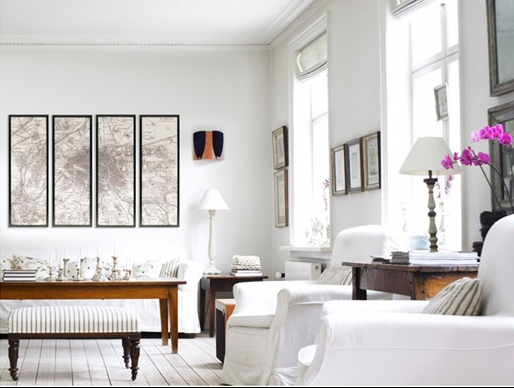 Instead, opt for a light or a pair of lights with a bit more visual impact, in either size, finish or both. These are all better scaled and have much better visual impact. 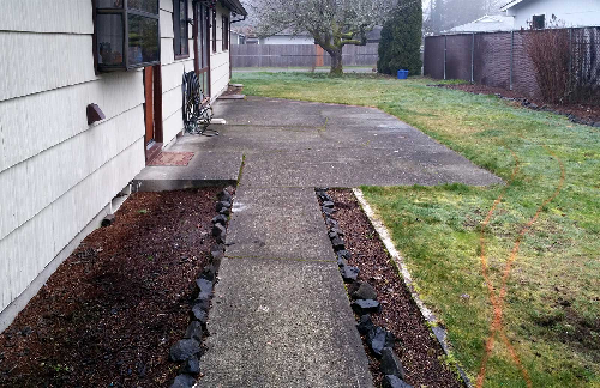 Swap out that boring cement walkway for pavers. For most, unless you are an uber-DIYer, this will require you to hire someone, especially to remove the old cement walkway and to haul it away because your garbage man won’t appreciate gigantic chunks of concrete in your trashcan. 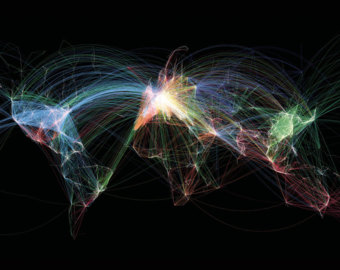 However, the impact will be amazing and immediate. If the front of your house is naked and adding a complete porch is out of the question, consider adding a small pergola. Sure, you’ll still need to probably consult a professional to do it but it’s not nearly as much of an investment as a porch but will provide instant curb appeal and visual impact.